The gait of the Peruvian horse is an ambling four beat lateral gait. The footfall sequence is left hind, left fore, right hind, right fore.The gait is natural and genetically inbred. The purpose is to cover long distances over a short period of time without tiring the horse or rider. This lateral gait is very smooth eliminating the up and down movement of the horse's back and the need for the rider to post. The ride is very stable with the horse having two and sometimes three feet on the ground at once. 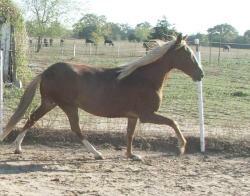 The main sequences of the gait are the paso llano and the faster sobreandando. 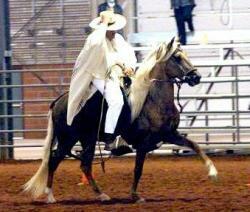 A trait of the Peruvian Paso gait is termino which is an outward swinging action of the forelegs. Termino originates from the shoulder with individual horses displaying more or less termino.